I actually love spring, especially when it’s not too busy in the office and I can plan occasional weekend getaways. The last years, my weekends were quite crazy during spring: from 72-hour-trips to India via a weekend at the Aman Sveti Stefan in Montenegro, to a weekend in Capri with a connection time in Naples of less than 30 minutes changing from harbor to airport. To put the stress level much lower this time, I went on a slightly different journey with my favorite airline: Austrian Airlines. How about a weekend in the US? Well most of you would immediately question how that’s possible with the time change. But that’s actually the point. Since I have already been in Miami and New York City, the choice was either Washington or Chicago. Since I wanted to fly the Boeing 777 again, I went for the Chicago route. Austrian Airlines leaves for Chicago daily (from October onwards) in the morning at 10.45 am. This way I could sleep until 8 am, got a cab to the airport at 8.30 am and arrived there about 1 hour and 45 minutes ahead of departure. The check-in was easy and is done in a dedicated area for Star Alliance Gold Members and Business class passengers. From there you access the priority security check with a maximum waiting time of 2 minutes. Then it goes directly to the Lounge at the G gates after you have passed the passport check. 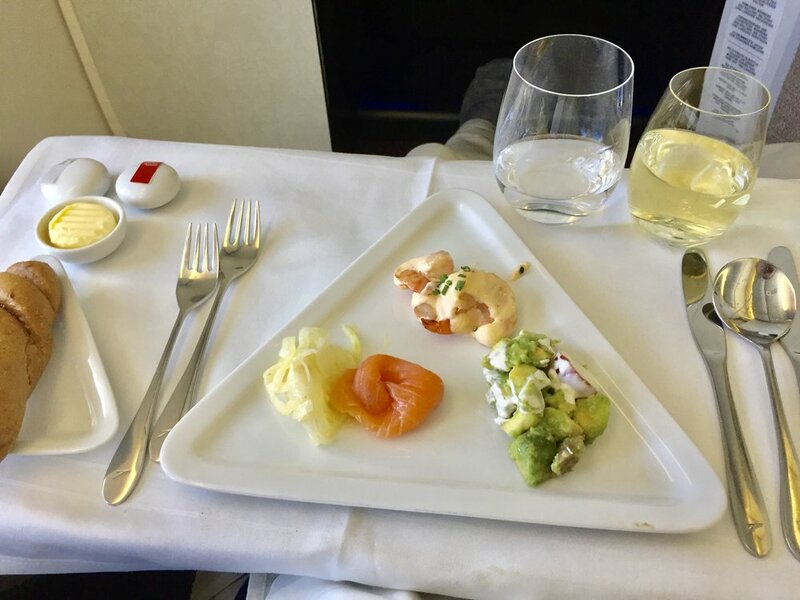 I have seen the SKY Lounge already when flying out to Miami last summer, so I was interested in the Austrian Business Class Lounge and unfortunately it did not meet my expectation considering Austrian Airlines is catered by Do & Co. I would say this lounge is no reason for a connecting in Vienna. There was just one hot dish for breakfast along a few breads with butter and spread including ham and cheese. Being the busiest hour due to the North American flights leaving all around the same time, I still found an available chair in the lounge which was a plus. Generally you can say Austrian Airlines Business Class Lounge is equal to the Sky Lounge. Quite on time I arrived on the gate, however boarding started a bit late so there was a waiting time on the gate. I appreciate that there is a reserved area ensuring that the business class guests can seat while waiting. When I was boarded, I was welcomed by two very friendly crew members indicating the way. As a business class passenger you are offered help with your jackets which will be stored until landing. By the time, the aperitif arrived: they have prepared the special “Donau” cocktail consisting of Blue Curacao, grenadine, sparkling wine and gin. As Austria’s flag carrier and nearly five-star airline, the crew goes through the rows with a trolley displaying national and international newspapers and magazines. I went for my favorite Falstaff magazine along The New York Times. Soon before we were taxiing, the chef arrived and introduced me to the menu. I ordered the truffle-stuffed chicken breast with asparagus and brioche squares. The starters come on a trolley to choose at the seat, just like the soup and the dessert – homage to the old school Viennese tradition. Luckily our flight was not on time, so I could enjoy another round of champagne before we finally took off in direction Chicago. About cruising level, the crew arrived with the cutlery, nuts and the drinks. Soon afterward the antipasti trolley arrived and I went for a selection of tomato-avocado salad, prawns with mango as well as salmon before I was served a potato soup. 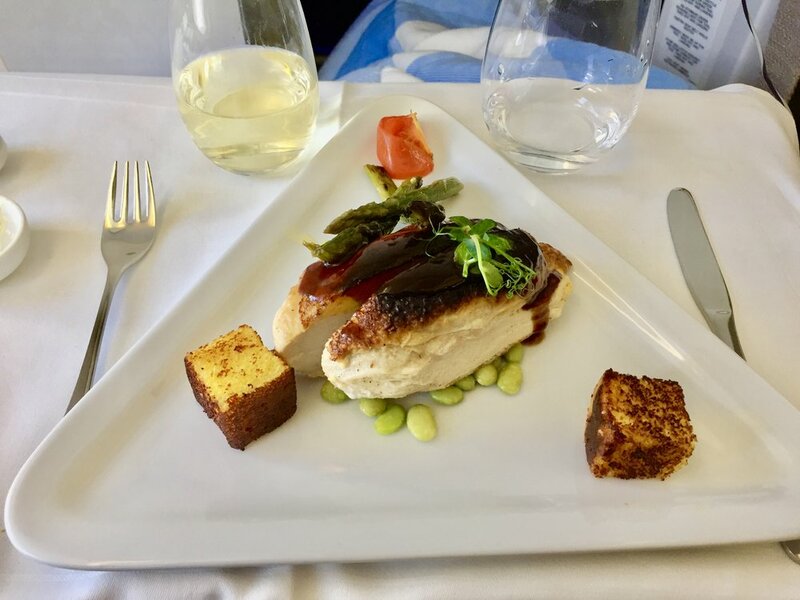 For the main course, I had the above-mentioned chicken breast which was just incredibly delicious for an onboard meal. Considering that Austrian Airlines was again voted the best business class catering, the desserts didn’t disappoint – fresh blueberry cut-up and sugared pancake along with a mix of chocolate mousse or mango sorbet with fresh fruits. Honestly, I could fly Austrian Airlines Business Class just because of their sweet wine which has always come from Austrian winery Kracher, famous for the best sweet wines for years. After the lunch, I watched a few movies and did some work. The only downside of the amazing entertainment system is that the selection of movies is not too up-to-date and they have a very dense selection of movies from 2018. Even though you will find classics like the Sound of Music or Murder on the Orient Express, I was expecting a bit more new movies running in the cinema currently. Aside from that, the staff remained attentive and offered drinks as well as a bar in between the two business class cabins. On my flight back from the US, which was an overnight flight, the amenity kit included a note that the crew would prepare a bed for a better sleep. Unfortunately, it wasn’t offered actively so I ended up rolling out a blanket and sleeping on top of another blanket from the neighboring seat. On my next flight, I will make use of the bedding service tough. Before the landing, they served another snack which was a Burrata on a carpaccio of tomatoes this time. Needless to say that it tasted as good as in an Italian restaurant in Vienna. Although we started with a delay, our arrival was on time and it felt like one of the shortest transatlantic flights I have ever had. In the next months, Austrian Airlines business class will feature some additional updates such as an upgraded amenity kit along with a special bar menu with cocktails prepared onboard. For sure another reason to fly business class with Austrian Airlines in the next few years.